Zen Life Tea Co. brings you dashing teaware products that allows you to pursue a wholesome and healthy life. The Correct Size, for Any Occasion. -Need 2 cups of tea? Or 3? Or 4? No problem, we got you covered. Not too large, not too small, yet light enough for your tea drinking needs, enjoy your tea in your office, or at home in style. High-Quality Borosilicate Glass for All Your Tea-Drinking Needs. -Made to stand the test of time and dishwasher safe, borosilicate glass is known for its light but strong properties, hence its widespread use in many laboratory equipment. -The teapot includes a long stainless steel infuser and lid which allows for a more effective infusing process. Stainless Steel Tea Infuser, Beautiful and Simple to Clean. 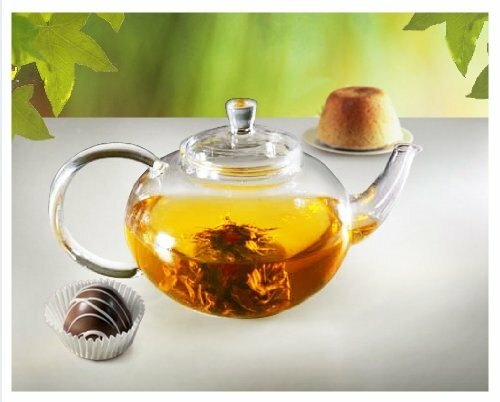 -Enjoy a refreshing cup of tea whenever you like with our beautiful contemporary teapot and matching stainless steel infuser and lid. -Clean the infuser by removing the tea leaves and wash it under the tap easily. Dishwasher safe, this teapot will no doubt be a delight addition to your life. Watch your Loose Tea Leaves Come to Life. -Just place tea leaves inside the insert, then add hot water into the infuser. Watch as your tea leaves infuses throughout your pot with color. Attractive and Sleek Design to Impress Your Guests. -The teapot's sleek design will complement your kitchen and look sophisticated while sitting on your table top. What are you waiting for? Order one today!